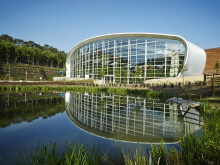 The Subtropical Swimming Paradise is an iconic part of the Center Parcs Villages, where families can enjoy a variety of pools and water experiences. They are one of the most popular elements of a Center Parcs break with over 90% of guests visiting the Subtropical Swimming Paradise during their stay. 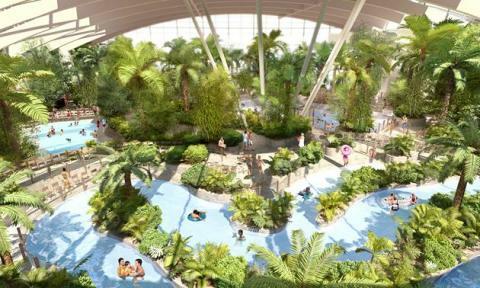 Woburn Forest will have the largest Subtropical Swimming Paradise in the UK with lots of exciting new features. The new shape has been revealed as a clam rather than the classic dome, pyramid or butterfly shapes at other UK Center Parcs. The clam will be nestled within the forest landscape with stunning views through the enormous glazed fascia. The designs showcase the tropical environment and family-friendly experience that the Subtropical Swimming Paradise will offer. Guests will be able to ride the Wild Water Rapids, in the open air outside the front of the clam-shaped structure, with views of the forest landscape around them. There will also be a wave pool, toddler pool, family play area, Lazy River and three exciting new water rides; Tornado, Twister and Typhoon, which will be unique to Woburn Forest. As with all the Center Parcs Villages, the environment inside the Subtropical Swimming Paradise will be heated to 29.5°C all year round with a wide variety of tropical plants rescued from around the world creating a truly tropical sensation for guests. The build of the Subtropical Swimming Paradise is on track, with all the Glulam wooden beams that support the roof in place and basement works almost complete. The construction of the roof will begin in July with a completion date for the entire structure of January 2014 ready for the delicate process of bringing in the tropical plants. With a matter of months until the new Center Parcs, Woburn Forest, opens, there is lots of activity on the Village. The buildings and forest are looking good, recruitment is well underway and we are already receiving deliveries to the site in preparation for the spring. Today, Center Parcs will see the first delivery of tropical plants, rescued from East Asia by Jean Henkens (Botanist and Landscape Architect), arrive at the new site, Woburn Forest in Bedfordshire. More than 6,000 tropical plants will be arriving at Woburn Forest during the spring with 4,800 of those earmarked for the Subtropical Swimming Paradise in the Village Square.